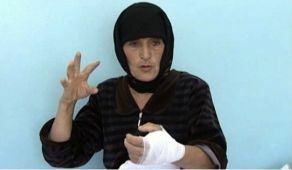 A woman from a village in southern Russia fought off a wolf with her bare hands and killed it with an axe. Aishat Maksudova from Novo Biryuzyak village in the Russian North Caucasus republic of Dagestan was with a group of villagers herding cows and sheep. She heard the cry of a calf being attacked by the wolf.Mrs Maksudova managed to save the calf but the wolf then turned its attention to her, clamping its jaws on to her hand.